DK Feeding Your Baby Day-by-Day Handbook | Multicolour | This book will guide you regarding the feeding your baby Day by Day with recipes and essential know-how that helps guide parents of young children through the often difficult weaning process. 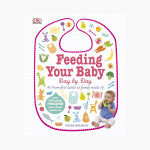 A comprehensive guide to feeding your baby, this handbook is quite useful for new parents. It will flourish you with more than 200 different recipes and provides step-by-step feeding instructions along with family-friendly menu planners. Feature 1 : This book will guide you regarding the feeding your baby Day by Day with recipes and essential know-how that helps guide parents of young children through the often difficult weaning process.